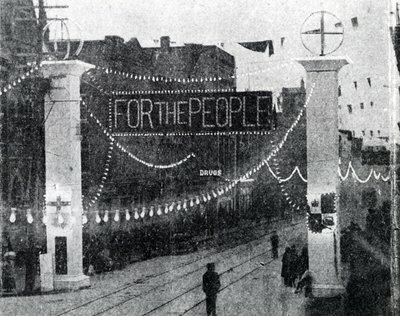 The electrified "For The People" sign across King Street in Berlin, Ontario, marking the arrival of hydroelectricity in Berlin on October 11, 1910. View this and more images from the day on Kitchener Public Library's archive. Did you know that Kitchener-Waterloo was the first community in Ontario to be electrified by long-distance transmission lines operated by what we now call Hydro One? The flipping of the switch drew thousands of people to downtown Kitchener (then Berlin) to watch the lights come on. Over 100 years later, another huge shift is coming in the way we access energy. The inaugural Power Shift WR was a weeklong (April 17-23, 2016) series of events hosted by an outstanding group of community partners that sparked a discussion about the Waterloo Region’s relationship with energy. Events for children, families and adults took place in Kitchener, Cambridge and Waterloo. More information and video of this talk can be found here. Display of Up-Cycled artwork by Cambridge elementary and secondary students in the children’s department of Idea Exchange, Queen’s Square. This exhibition is part of an annual exhibition series organized and curated by Sherry Wong. More information about the exhibit and Sherry Wong can be found here. More information and trailer can be found here. REEP Representatives delivered presentations at Waterloo Public Library and the University of Waterloo during #PowerShiftWR. More information about REEP's services and programs can be found here. More information including 2015 honorees can be found here. More information about Discourse Media's energy reporting can be found here. More information about TREC's workshops and programs can be found here. More information about Søren and Samsø Island can be found here. Video of this talk is available here. April 22, 2016 Photos from the day can be found here.